Moroccan Foreign Minister Nasser Bourita attended on Wednesday, February the 6th, the ministerial meeting of the member states of the Global Coalition to defeat ISIS, held in Washington. On the sidelines of this meeting Bourita met the United States Secretary of State Mike Pompeo. During this meeting attended by Morocco’s ambassador to the United States Lalla Joumala Alaoui, the two officials hailed the «longstanding strategic partnership between the United States and Morocco». In a communiqué published Wednesday, the US State Department stated that Bourita and Pompeo «discussed opportunities to expand cooperation on regional issues». Speaking to the Moroccan Minister, the Secretary «acknowledged Morocco’s constructive participation in talks with the UN Personal Envoy for Western Sahara». 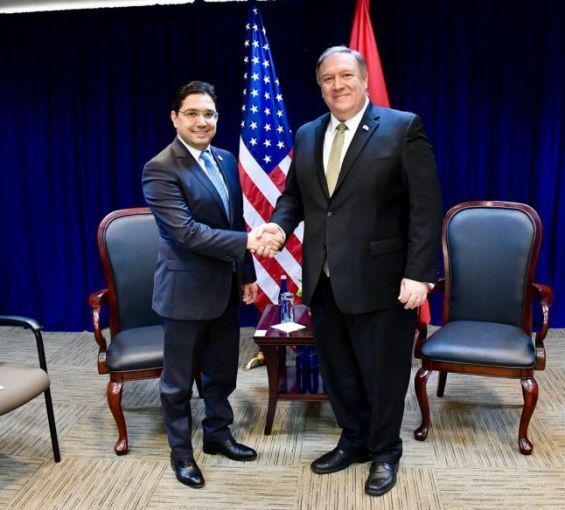 Pompeo thanked Rabat for its «its resolute efforts to counter Iran’s malign influence in the region and Foreign Minister for his support of Venezuelan Interim President Juan Guiadó». Moreover, the two officials discussed the upcoming «Ministerial to Promote a Future of Peace and Security in the Middle East and noted that it would be an important step toward building a stronger security framework in the Middle East», concluded the same statement. While in Washington, Nasser Bourita did not meet with National Security Advisor of the United States John Bolton, as it was predicted by several news platform in the Kingdom. Nasser Bourita’s «agenda did not include a meeting with Bolton», a well-informed source told Yabiladi. In Washington, Bourita met Tuesday, February the 5th during a business dinner with the United States Under Secretary of State for Political Affairs David Hale before holding talks with Pompeo. In principle, the two men are expected to meet again on the 13th and 14th of February in Warsaw, where they would attend an anti-Iran coalition meeting co-chaired by the United States and Poland. For the record, The Global Coalition meets regularly to coordinate and improve joint efforts to counter ISIS. The last ministerial meeting was held on July 12, 2018, with some of the member countries of the Coalition. Morocco hosted, on June 26, 2018 in Rabat, the last meeting of political directors of the Coalition to defeat ISIS.